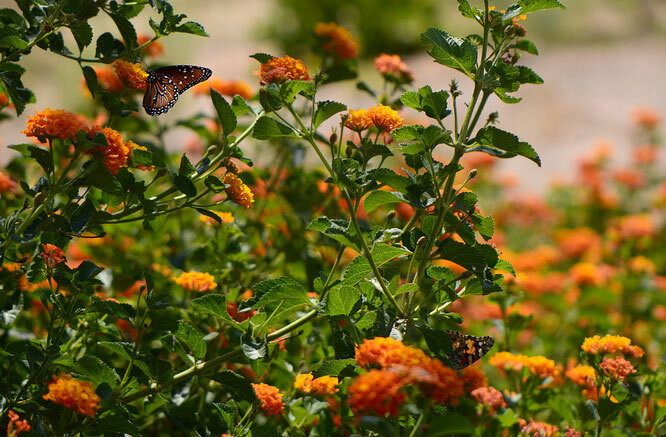 Although temperatures remain high, it is nearly autumn even here, and the butterflies are beginning to flutter into the garden, coming south to enjoy the sunlight and warmth of a desert winter. As ever, they adore the lantana. 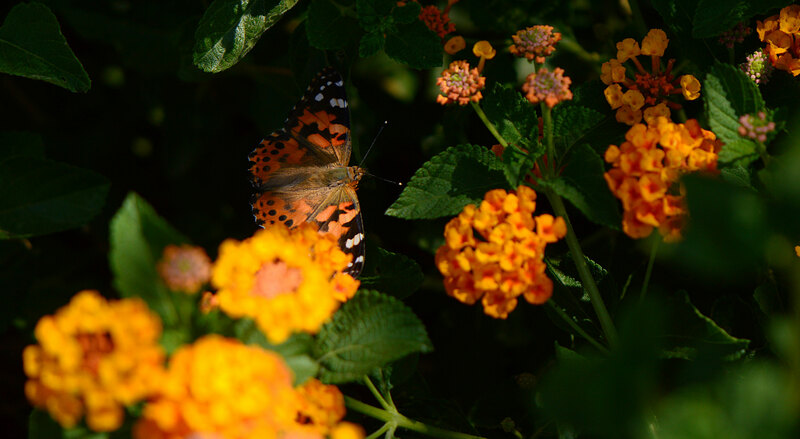 At this stage, the most easily noticed are the Painted Ladies, Vanessa cardui, but I have been seeing an assortment of others, including one or two Queens, Danaus gilippus. The sunlight is still so strong here that it was difficult to get photos of butterflies with their wings open. They don't really need to sun themselves very much! I'm sure they are plenty warm without that. In any case, it's lovely to see the garden coming alive again with graceful wings. 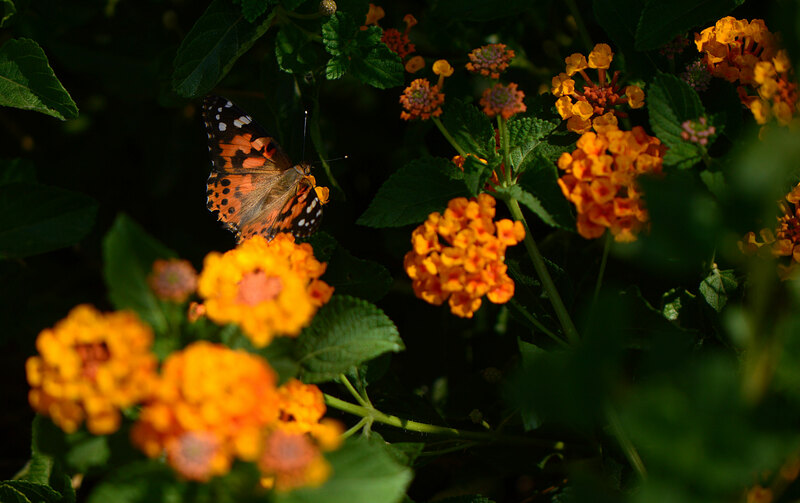 They look especially beautiful with the orange Lantana as a backdrop. It's a wonderful combination, isn't it?! And certainly gives a whole new look to butterfly 'camouflage'... ;-) Thanks, Kris! The Queen Butterfly is a beautiful dark red, it is one I haven't seen a picture of before. Brian - It's quite a beautiful butterfly and one I hadn't seen till I moved here, no doubt because they are chiefly tropical. I'm always mistaking them for Viceroys, which mimic Monarchs. The Queens are actually much more closely related to the true Monarch and also favor milkweed for caterpillars and adults. I wish I could have gotten a shot with the wings outspread - maybe later! Lovely shots Amy. I am also always delighted to see the butterflies arriving inncycles throughout the year. The latest here are now the Peacocks, which love our sedum flowers. I haven't seen a Painted Lady yet this year, but there are Red Admirals around here too. 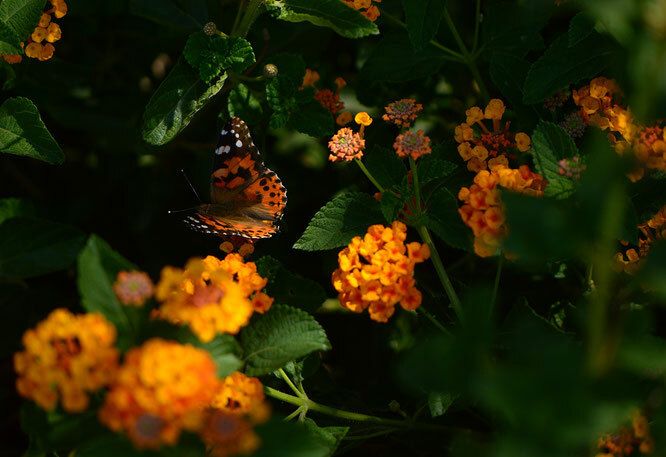 Isn't it amazing that we have some of the same butterflies so many miles away from you! Do they spend the winter in your region, or fly further south?